Wow, you've already pulled the wall apart on your new master bedroom. I can't wait to see pictures as you go. I know your bedroom suite will be amazing when it's all finished. Ooooooh, how exciting! Can't wait to see the progress! I bet it's going to be wonderful when this is finished. Looking forward to watching the progress. Love watching this all come together! It's going to be so amazing when its all done. What an undertaking! I cried a bit when I saw that you gutted the closet wall. :( Interesting that they spliced the stud between the closets. Funny all the things you find. So now that the entire closet will serve the Master Bedroom, what kind of door(s) are you considering? changes are amazing and don't you love making that house your home? just as so many before you have done. This will be a great master bedroom suite. Nice view out of those windows. It's really helpful that you link back to old posts with details about each room or section of the house! DFW, I think so. And if it keeps on raining, we may be done faster than we thought. Renee, I was so frustrated with my closet. I could never find or get to anything in it. Right now we're thinking about bypass doors. I think that would give the best access. Sandra, the changes are amazing. Who would have thought. And it's interesting, as we tear things down, what we find underneath. We see where previous changes have been made, so interesting. Always good to have indoor projects on the go for when it's raining. Looking great! Exciting! Renovations of any kind, are always a hassle, but when it is done, you can breathe a sigh of relief and say...OK, on to the next one :) m.
LOL! Funny, to me anyway. You're working on a bedroom, while I'm trying to get a foundation installed to live in over this coming winter. I don't know if I'm going to make it, but it looks like you're on track. Bridget, I agree. The hard thing is learning how to switch mental gears! This is going to be a fun project to watch. This room has the potential of being such a haven of rest for you guys. I agree that having a larger closet will be very nice. Sweet! I love these kinds of projects, and I can't wait to read about your adventures. You two have a great way of approaching these things and I'm sure the end result will be fantastic! We've found that, like you, one can never predict what one will find when tearing into remodeling. It's always a surprise . . . and most of the time not a good one! Of course, our aim is to make it all better, right?? Benita, I hope so. 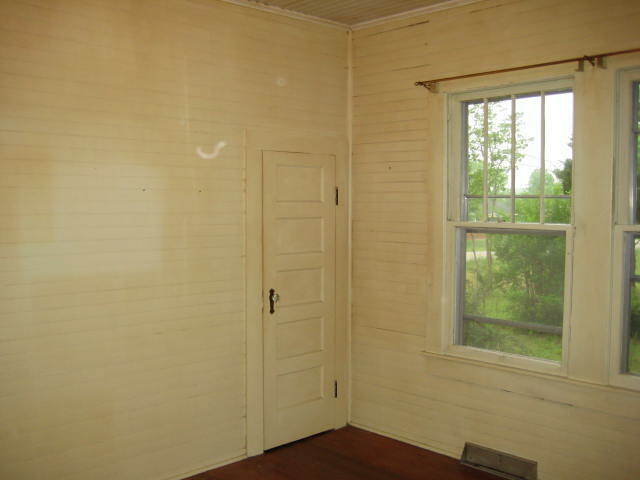 The room we have now is drafty and those tongue and groove walls and ceilings aren't in the best repair. I think Dan will press on because he's anxious to get out of that old bedroom! Nooo don't replace those windows! 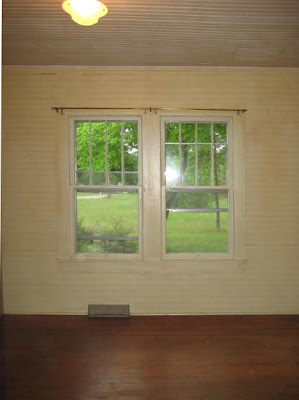 They may certainly be drafty and in need of restoration, but if re-installed properly or even restored with doublepaned glass, you will see no noticeable difference in energy loss old to new....I know, because I restore old windows! Countless studies have shown that investing in a bottle of caulk and sealing openings and proper flashing are far better investments that even touching windows! The catch is that for Pella/contractors it's easier and more profitable to pop in new ones and haul away the old! We love your blog, and are jealous of the T&G board throughout...wish our old farmhouse had all of these details! Good Luck! Shawn, aw, you're too late! Never heard of window restoration. We are, however, planning to put the old windows to future use in another project. I'm just finishing a post about those bedroom windows plus the wall, to be published probably on Saturday. We have received an excessive amount of rain this summer as well, and our temps are also at or more than 10 degrees cooler than normal. We usually get over 100 easily but this summer we've barely topped 90. A nice break for the rabbits but not so nice for my garden. Tomatoes rotting, not enough sun, the list goes on. Love to see your fruit harvest and variety! Good job. Candace, thanks! Now we can't help but wonder what winter will be like. If the same amounts of precipitation continue but in snow, our house will be buried!